10 Series pumps are available with Gorman-Rupp double mechanical grease lubricated seals, self-lubricated mechanical seals and Gorman-Rupp's exclusive tungsten titanium carbide double floating, self-aligning oil Lubricated seals. Fluorocarbon Elastomers (DuPont VitonÂ® or equivalent) and PTFE Elastomers (DuPont TeflonÂ® or equivalent) are also available. 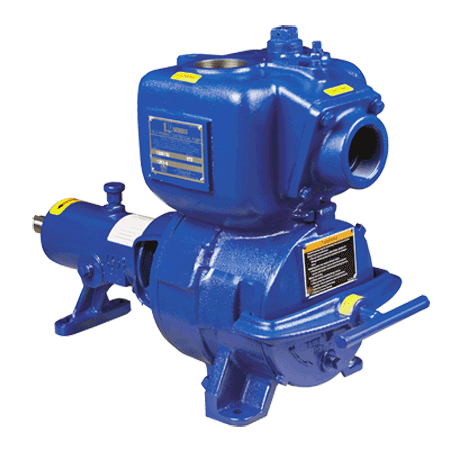 Removable cover plate provides quick and easy access to pump interior without disconnecting piping. Clogs can be removed and pump returned to service in minutes. Impeller, seal and replaceable wearplate can also be easily accessed through cover plate opening for inspection or service.